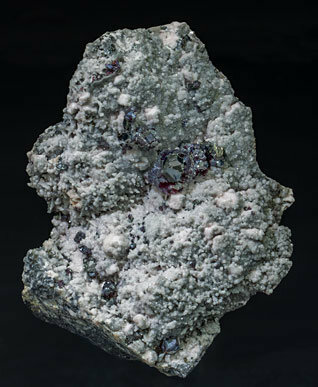 Very aerial aggregate of very sharp Pearceite crystals (polytype T2ac). They are thick tabular, have a very well defined pseudohexagonal shape, are extraordinarily bright, are on a group of Proustite crystals and are on matrix, with Rhodochrosite. Both the Pearceite and Proustite, as well as the Rhodochrosite, have been analyzed and we will send a copy of the three analyses to the buyer. Even bigger Pearceite crystals exist, very few of them as aesthetic as this one.